Since the publication of his ground-breaking doctoral thesis, Making Evangelical Missionaries, 1789-1858 (1984), Stuart Piggin has published more than 100 academic articles and seven books, a number of which have become classics in the field. 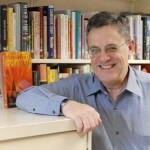 While his most distinguished contribution to international religious history has been focused on the history of Evangelical Christianity, Stuart has also written a critical history of the Mount Kembla Disaster of 1902 (OUP, 1992) and his work has spanned the full range of critical, social and political studies of Evangelical Christianity in the English-speaking world. His landmark work, Evangelical Christianity in Australia: Spirit, Word and Work (OUP, 1996) defined a new agenda for the interpretation of the influence of Protestant Christianity – and of religion generally – in Australian history, politics and society. Stuart has also played a critical role in public reception of new research in religious history, including presentations to the first National Forum on Australia’s Christian Heritage in Parliament House, Canberra and establishing the Centre for the Study of Australian Christianity during the period he was Master of Robert Menzies College at Macquarie University from 1990 to 2004. He has been a mentor to many new and established researchers in the field, supervising a stream of PhD students, many fostered through his ongoing seminar on Christian history in connection with the Centre for the History of Christian Thought and Experience at Macquarie University. Stuart Piggin became a Member of the Association for the Association for the Journal of Religious History in 1990, later serving on the Executive. During the period when the old Association was struggling to adjust to the retirement of the first generation who had created the Journal in 1960, he played a leading role in the negotiations which led to the formation of the Religious History Association through the amalgamation of the Association for the Journal of Religious History and the Religious History Society in 2010, including the suggestion for the name of the new organisation. He served as Secretary of the Religious History Association from its formation in 2010 until 2013. Stuart has been at the heart of the scholarly study of religious history in Australia for more than three decades during which time he has been instrumental in the growth of religious history as a part of the Academy in Australia.